Sometime on a cold winter day in the late 1960s, a jazzy suit wearing Chrysler product man had a brilliant idea. 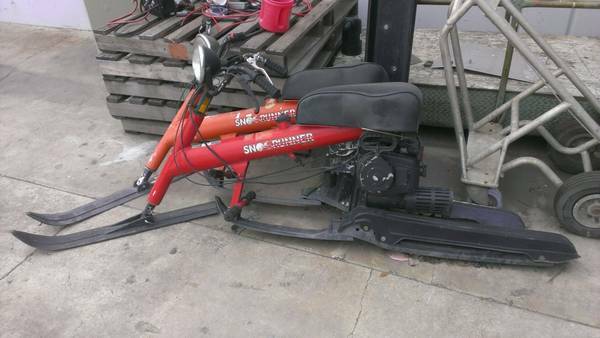 Imagine combining the snow slaying capability of a snowmobile with the fun & cost of a moped -- and the Sno Runner was born. 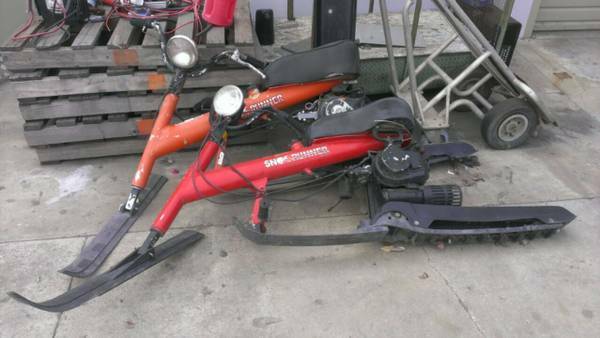 Find these 1970s Chrysler Marine Sno Runners offered for $1,000 in La Habra, CA via craigslist. On paper vellum, in a smoke filled 1960s Chrysler Outboard Marine division board room, the Sno Runner seemed like a sure thing -- basically a powered SkiBob, or half a snowmobile. Unfortunately for Chrysler, a recession was going to decimate their bottom line, and a 7 horsepower snow-ped that could barely hit 25mph on flat ground made about as much sense to a consumer as a pepto pink Dodge Challenger. Don't get me wrong, I think that a Sno Runner looks like a doozie of a good time, but then I like sketchy handling vehicles that might fall over at speed without a hint of warning. With a wheeled vehicle, even something as slow as a moped has a considerable advantage due to the magic of gyroscopic stability and the fact that tires grip the road exactly a million times better than a rigid mounted ski grips snow/slush/ice/the-edge-of-a-cliff. If you want more info on the Sno Runner, the above video from youtube gives some more details, and oddly enough you can buy all sorts of service/repair parts and cans of Mountain Dew on Snorunner.com. Vince, will you ship these up to AK? I was skiing last month and watching snowmobiles zoom around the hillsides when a vision of a narrow, bike-like, powered mini snowmobile popped into my head. I thought I couldn't have been the first to think of this, although I've never seen such a thing. Glad to know that good ol' Chrysler Corp was way ahead of me on this one! Wow! The Sno-Ped just caused flashbacks of a summer in the 80's riding one of these [img]http://www.deckjetwatercraft.com/ultranautics/art/wetbike3.jpg[/img] Thankfully the SnowBike was able to rinse it away.